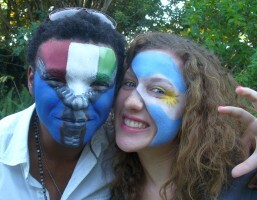 Football fans, crazy pictures, beautiful fans, and face painting ideas. 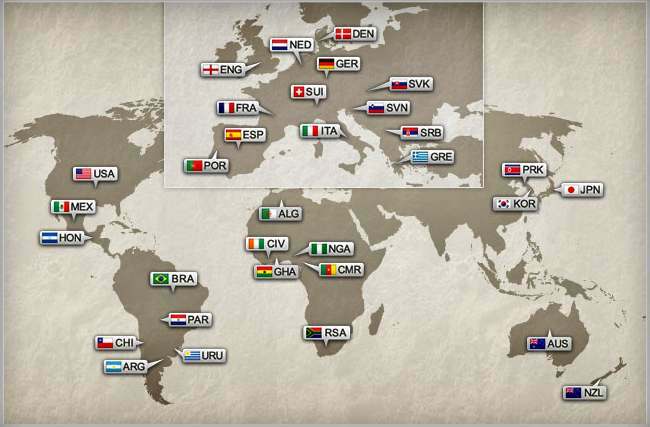 In the Football and Soccer world, the FIFA Soccer World Cup is a huge global event. 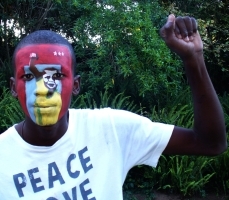 This World Cup 2010, is taking place in South Africa. 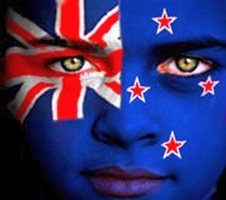 This page is devoted to the football fans that really goes all out to support their nations, with some passion and flair. 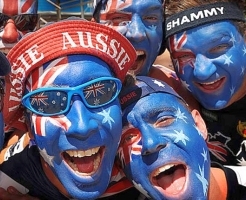 Soccer and football fans are known for fanatical support bordering on mania and even violence at times. 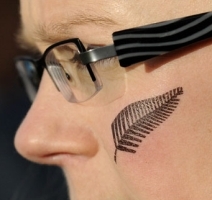 Do you need Face Paint to support your team? 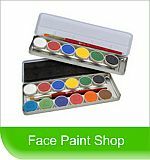 Our Online SHOP has comfortable and professional grade face paint. 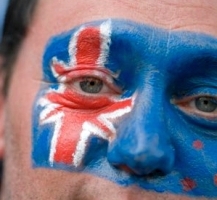 Top quality fan face paint that won't be itchy, at reasonable prices. 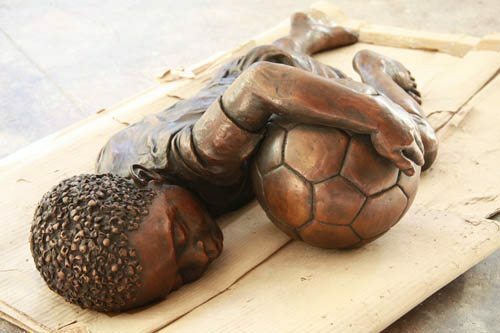 This Image to the left courtesy of Duncan Stewart - A Bronze - (Streetwise) “If you lose hope, somehow you lose the vitality that keeps life moving, you lose that courage to be, that quality that helps you go on in spite of it all. And so today I still have a dream”. - Martin Luther King, jr. The final line up of countries who have qualified for the 2010 FIFA World Cup is as follows: Nigeria, Cameroon, New Zealand, Japan, Netherlands, North Korea, South Korea, Australia, USA, Brazil, Ghana, England, Paraguay, Spain, Denmark, Cote d’Ivoire, Chile, Germany, Italy, Mexico, Serbia, Switzerland, Argentina, Honduras, Slovakia, Algeria, Portugal, France, Slovenia, Greece, Uruguay and host South Africa. Three-time FIFA World Cup™ winners Germany are usually there or thereabouts when the honours are handed out, and the current national squad will head for South Africa with their sights and expectations set appropriately high. After triumphing in Switzerland in 1954, on home soil in 1974 and in Italy in 1990, the team now coached by Joachim Low are aiming to hoist the most prestigious trophy in the world's favourite sport for the fourth time. The Germans' consistent success is based on deep reserves of experience, finely-honed tactical know-how, and the ability to rise to the occasion when the chips are down. After a 32-year absence from the world stage, Australia made a strong statement at the 2006 FIFA World Cup™, reaching the knockout stage where it took a last-minute goal from eventual champions Italy to eliminate Guus Hiddink's team. The squad, now under another Dutchman, Pim Verbeek, features many of the Germany 2006 personnel and is a battle-hardened and experienced group.Unlike four years ago when Australia qualified through via the Oceania zone, and finally a dramatic play-off against Uruguay, the preparation for the Socceroos this time is very different following a lengthy campaign across the length and breadth of Asia. Serbia played their maiden international, independently, on 16 August 2006, winning 3-1 away to Czech Republic. They did, however, former part of two now disbanded teams: Yugoslavia and Serbia and Montenegro. The former participated at nine FIFA World Cups™ between 1930 and 2002, and finished runners-up at the UEFA European Championship twice. Then, at Germany 2006, Serbia and Montenegro lost all three matches in a competitive group to fall at the first hurdle. While Yugoslavia and Serbia and Montengro wore blue shirts, Serbia adopted a red jersey and the nickname Beli Orlovi (White Eagles). The only African side to get out of the group stage at the 2006 FIFA World Cup Germany™ and the first to qualify for South Africa 2010, Ghana are anxious to prove themselves as the cream of the continent. Though this will be only their second appearance at the finals, the Black Stars have enjoyed considerable success at all levels of international football. They have won four CAF African Cup of Nations titles, though none since 1982, as well as two FIFA U-17 World Cups, and they became the first African team to lift the FIFA U-20 World Cup when they beat Brazil on penalties in October 2009. With added experience since their 2006 adventure, where they lost to Italy and Brazil but beat the Czech Republic and USA, Ghana are set to be a major threat at Africa's first FIFA World Cup. The final or bust. The Oranje have set lofty aims for their campaign in South Africa, 32 years after their 3-1 extra-time defeat by Argentina in the showpiece game, which itself came four years on from their 2-1 final loss to West Germany. Since the retirement of pioneering coach Rinus Michels, a multitude of players have followed in the footsteps of the Johan Cruyff generation without ever advancing as far as the final hurdle, though one particularly talented crop did claim the European title in 1988. 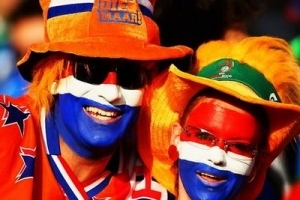 Often seen as spectacular but mentally fragile, the Netherlands hope to banish that image under Bert van Marwijk, who took over in the wake of their disappointing UEFA EURO 2008 campaign. After a six-year absence, Danish Dynamite is once again set to explode on the elite world footballing scene. The Scandinavians missed out on both the 2006 FIFA World Cup™ in Germany and UEFA EURO 2008 in Austria and Switzerland, but the FIFA founder members blazed an impressive trail en route to a berth in South Africa next summer. 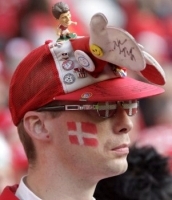 The Danes will now be looking to extend their creditable record at three previous finals appearances, where they reached the Round of 16 twice and the quarter-finals on the other occasion. 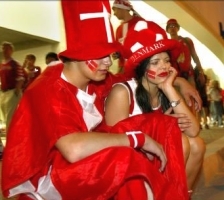 Denmark's first tilt at the trophy was in 1986 in Mexico, where they progressed to the last sixteen. The core of that team then went on to register the nation's greatest footballing triumph with the 1992 UEFA European Championship crown in neighbouring Sweden. 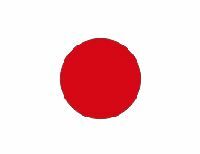 Boasting one of the strongest squads in Asian football, Japan, winners of three of the last five editions of the AFC Asian Cup, have high hopes for the 2010 FIFA World Cup South Africa™ - their fourth appearance at the global showpiece. 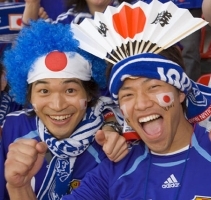 First on the agenda is an improvement on the disappointing showing at Germany 2006, when the Samurai Blue exited at the first hurdle after a 3-1 reverse against Australia, a 0-0 draw with Croatia and a resounding 4-1 defeat by Brazil. Japan will also be facing their first finals without iconic midfielder Hidetoshi Nakata. The former Roma schemer featured in each of the national side's games at France 1998, Korea/Japan 2002 and Germany 2006 before hanging up his boots after the latter event aged just 29. 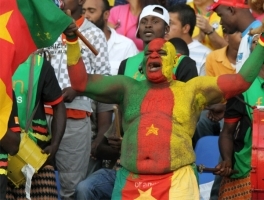 Though their light may have faded somewhat since they brightened up the world stage at the 1990 FIFA World Cup™, Cameroon are not a side to underestimate at the 2010 FIFA World Cup in South Africa. The top African nation in FIFA’s rankings, they also bring Africa’s richest pedigree to the finals. 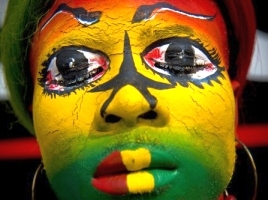 They have appeared a continental-best five times in the World Cup, and no other African side has yet eclipsed their historic run to the Italy 1990 quarter-finals – though Senegal equaled the achievement in 2002. 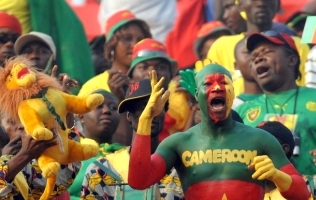 Cameroon have played in 17 FIFA World Cup matches, the most of any national team from Africa. Their 1-0 defeat of holders Argentina to kick off the 1990 FIFA World Cup is one of the great upsets in the history of the event. Defending champions Italy will naturally be one of the leading contenders to emerge triumphant at the 2010 FIFA World Cup™ South Africa. The only country along with Brazil to have won the tournament twice in succession, Marcello Lippi's men will be vying to match the performance of their pioneering predecessors in 1934 and 1938. Italy have qualified for 16 of the 18 FIFA World Cup finals, failing to book themselves a place in 1958 and having not opted to take part in the first edition in 1930. They have won the competition on four occasions, in 1934, 1938, 1982 and four years ago in 2006. They also finished runners-up in 1970 and 1994 and claimed third place on home soil in 1990. Having just put together their best ever qualification campaign, Paraguay are entitled to think big ahead of their fourth consecutive appearance at the FIFA World Cup™ finals. Under the guidance of Argentinian coach Gerardo Martino, the current Albirroja crop look to have what it takes to build on the progress made by their predecessors at France 1998 and Korea/Japan 2002, where the Paraguayans reached the Round of 16 before being knocked out by France and Germany respectively. Paraguay will be making their eight FIFA World Cup finals appearance next year and their fourth in a row. La Albirroja have never won two games at the same finals and have yet to progress beyond the Round of 16. After a disastrous campaign four years ago, New Zealand bounced back in emphatic fashion under coach Ricki Herbert to qualify for their first appearance on the world stage in 28 years following a debut showing at Spain 1982. Herbert, and assistant Brian Turner, were both key figures in the campaign nearly three decades ago. The duo have turned the All Whites into a solid unit whose rearguard, the fifth-placed Asian nation Bahrain was unable to breach over 180 minutes of the intercontinental play-off. 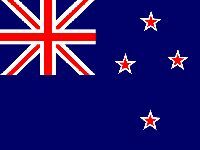 Four years after elimination by the Solomon Islands, the Kiwis claimed the Oceania crown to earn a trip to the 2009 FIFA Confederations Cup, where they showed solid form after a poor opening against European champions Spain. The dramatic South Africa 2010 play-off victory against Bahrain united the Rugby-mad nation behind the All Whites like never before, resulting in a national record crowd in the capital Wellington for the decisive qualifier. 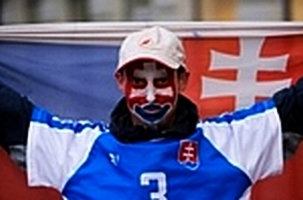 Appearing for the first time in a major international competition, Slovakia have been striving to relive the glory years enjoyed by the former Czechoslovakia since going it alone in 1993. While their team is hardly filled with household names, Slovakia can nonetheless rely on a well-organised collective with plenty of admirable qualities. Likewise, their continuing progress gives them good reason to be optimistic about their voyage to South Africa. Fourth in their section in qualifying for the 1998 FIFA World Cup™ France, third on the road to Korea/Japan 2002 and runners-up ahead of Germany 2006, Slovakia continued their rise by sealing top spot in Group 3. Vladimir Weiss's side booked their historic place on 14 October 2009, upsetting a number of predictions that they would struggle to cope with a difficult pool. Have A Great Football Fan Moment? Do you have a great fan picture and moment that was awesome? Share it with the world! Add your picture Here! Click the button and find it on your computer. Then select it. Argentina vs Germany, Sat 03 July, Cape Town - a match that got Messi with Germany thrashing Argentina 4 - 0. This lady was wrapped up warmly for the match at Soccer City Soweto South Africa. Rae goes wild with support for Germany! South Africa WC Soccer.